Nepal Adventure Trip 5 nights 6 days is the journey of diverse adventure sports like Bungee Jumping, Canyoning, and Whitewater Rafting. Bunjee Jumping is obviously one of the awe-inspiring adventure activities. 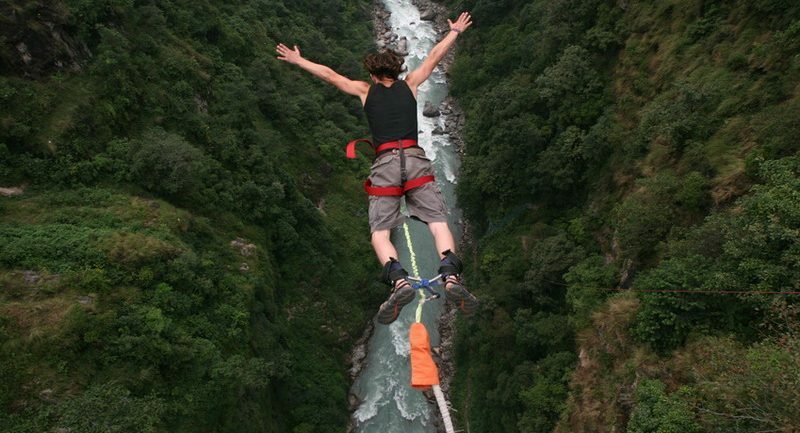 In this tour, you will be taken Nepal’s first Bungee Jump site which is located 160 meters over the Bhote Koshi River. This is perhaps the best bungee sites of the world. Here over the river, there is steel bridge which is 166 meters wide. This bridge was designed by New Zealand’s leading bungee consultants and engineers. From this bridge, it’s to jump down the river. It is said that 160 meter of fall is the longest free fall in the world. Before jumping, well-experienced jump masters instruct all the safety rules. Canyoning is the sport of jumping into a fast-flowing mountain stream and allowing oneself to be carried downstream at high speed. In this tour, Canyoning will be following the flow of the crystal streams above the Last resort that is near to the Bhote Koshi River. Rafting is another exciting adventurous sport. In this Adventure, tour rafting will be at Bhote Koshi which is more rapids. Nepal Adventure Trip 5 nights 6 days start from Kathmandu. On your arrival day after check into your hotel, you have free time of walking around Thamel, the market of many restaurants, cafes, bars, shops of trekking adventure gears and also different souvenirs. Next day you drive from Kathmandu to The Last Resort, the Bungee Jumping spot, 100 km, and takes around three and half hour’s drive. The Same day you Jump down 160 meters at the gorge of the Bhote Koshi river. Then you relax at the Last Resort. Accommodation at The Last Resort is a natural affair. Luxurious safari tents, spaciously set in lush gardens, ensure you a quiet and peaceful stay in an exotic setting. Another day you will be taken for adrenaline Canyoning following the flow of the crystal streams above the Last Resort. After Canyoning relaxes at the resort. On the following do you will go for Rafting on the Bhote Koshi River. After complete of rafting same day, you will drive back to Kathmandu. We always offer the best and competitive price for the trip of Nepal Adventure Tour 5 night/ 6 days. The package includes Bungee Jump in Last Resort, Canyoning and Rafting in the Bhote Koshi River along with night stay in The Last Resort. The price of this exciting journey will be different according to your group size (the number of persons you travel together) and the services you choose. For the price, you simply send us an inquiry with your group size. We hear back to you with the fair and accurate price including the list of services within 24 hours. The best time of starting this tour is in the month of Sep, Oct, Nov, Dec, Jan, Feb, Mar, Apr and May.We will be pleased to operate this holiday on any date which you feel comfortable. Nepal Adventure Tour 5 night/ 6 days is a superb holiday trip of Nepal. You can make it further exciting by joining in extra activities/ side trips. As the interest of people is different from each other, we have put these extra activities as optional tours. They are not included in your package cost. On your request, we offer you. The list of optional activities is displayed in right column. Day 2: Drive to Last Resort (Ultimate Bungee Jump Sport). Highlight: 3.5 hr Scenic drive/ Bungee Jump- 160 meter of free fall at the gorge of Bhote Koshi River/ Relax in The Last Resort. Day 3: Go for Canyoning trip. Highlight: Adrenaline Canyoning following the flow of the crystal streams above the Last resort. Day 4: Go for Whitewater Rafting. Drive to Kathmandu. Highlight: 3 hr exciting rafting on the Bhote Koshi River originated from Tibet (China). Day 5: Sightseeing of World Heritage Sites in Kathmandu. Highlight: Visit of Swoyambhunath, Kathmandu Durbar Square, Boudhanath & Pashupatinath temple/ Free time at leisure/ Culture Show and dinner with Nepali Cuisine. Day 6: Departure from Kathmandu, Nepal.